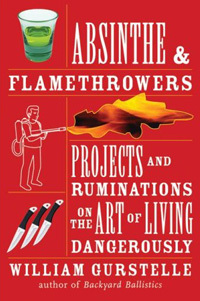 I can’t remember just how I came across William Gurstelle’s Absinthe & Flamethrowers: Projects and Ruminations on the Art of Living Dangerously, but I’m extremely glad that I did. Although it includes outlandish projects such as making your own gun powder and rocket fuel, Absinth‘s 195 pages stray from Gurstelle’s previous project-centric books such as Backyard Ballistics and Woosh, Boom, Splat!. Instead, Gurstelle takes a meandering stroll through his personal philosophy that responsible yet real danger is not only a lot of fun, but right good for us. The book explores our cultural discomfort with risk and danger and challenges the assumption that minimizing risk is always the correct path. As compelling as his case for “edge work” is, I have to give further credit to Gurstelle for admitting that not all of us are comfortable with even his very sensible embracing of danger. As such, it’s not a book that’s going to resonate with absolutely everyone. Instead, this book is written for who he identifies as “the Golden Third” — the 34% of the general population who have a higher comfort with risk, yet aren’t off the deep end taking risks far beyond reason and responsible citizenship. Gurstelle propositions, I think accurately, that this group (of which I am an enthusiastic member) often lacks constructive outlets for a sensible embrace of danger that really satisfies their yearning for exhilaration. Between our very litigious culture and the post 9/11 climate, Gurstelle’s assertion that the adventurous among us should embrace their inner MacGyver is both brave and refreshing. What are deep smarts? Dorothy Leonard, professor emeritus at the Harvard Business School, and Walter Swap, professor of psychology emeritus at Tufts University, coined the phrase in their well-regarded book by the same name. They define deep smarts as the accumulated know-how and intuition gained through extensive and varied experience. It’s expertise in the form of practical wisdom. Leonard and Swap tell us that it’s just such deep smarts that provide the foundation for an individual’s overall success. This “deep smarts” concept dovetails very nicely into what Matthew Crawford talks about in Shop Class as Soulcraft regarding the hands-on nature of real expertise. As valuable as education is, no book can ever teach you better than your own two hands. This applies to specific skills, such as Crawford’s work as a motorcycle mechanic, but also in building our own MacGyver-esque understanding of the world around us. Gurstelle isn’t done there, however. Artfully dangerous living has another benefit to impart. Taking risks proves your mettle, it displays your inner bravery. And successful outcomes in risky propositions lead to a well-deserved sense of accomplishment. These aren’t just my opinions. There is a considerable body of scientific evidence backing up this assertion. At least two rigorously conducted scientific studies statistically show that, in the long run, people who take reasonable risks are happier and more successful. He goes on to reference those studies in more depth. The bottom line is that your attitude toward risk has a direct effect on both your satisfaction in living, and your more tangible personal success in your career and other endeavors. “Playing it safe” rarely leads us to the success we really want. Never extending ourselves beyond the “safe” and the known robs us of both the satisfaction of success and the lessons of failure. Personally I’ve made this into a checklist of sorts. Not a “bucket list” of things to do someday, but more like a concert set list — things to be conquered in the near term. With the throttle screwed on there is only the barest margin, and no room at all for mistakes. It has to be done right…and that’s when the strange music starts, when you stretch your luck so far that fear becomes exhilaration.